As the new millennium dawned, Marlin and Hornady set out to provide lever action rifles that could match the performance of the venerable .308 Winchester and .30-06 Springfield. 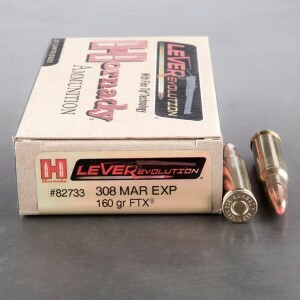 They succeeded handily with 308 Marlin Express! 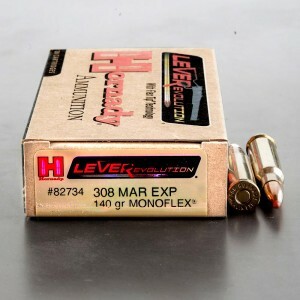 .308 Marlin Express ammo, when coupled with Hornady's new LEVERevolution polymer-tipped rounds which are expressly designed for tube-fed lever actions, comes really close to duplicating the .308 Winchester's performance envelope. With the ballistically superior spire-pointed bullets, the new lever action gun became a true long-range competitor wrapped up in a very quick-handling, compact platform. Using either 150 grain or 160 grain bullets, the caliber is capable of muzzle velocities in the 2500 feet per second range and energies topping 2500 foot pounds - both just shy of .308 Winchester performance using 165 grain bullets. A careful, practiced hunter armed with .308 Marlin Express ammunition is up to the task of facing most North American game with an economical gun that doesn't break the bank to acquire.